Yep, it’s now that easy. You can also use Bundle AMI on a non-running instance if you wish to upload an AMI to the store. Keep in mind that if you create an image of a running instance it will not be crash consistent and could have data issues. I’m doing this backwards. I’m currently writing another article about Amazon EC2 and getting started by moving your existing hosting service to EC2. However, I recently realized how much time and effort I had devoted to my EC2 Instance and getting things installed, configured, and running the way I want them. 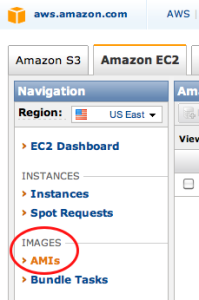 Then I stumbled upon this forum article: Degraded Amazon EC2 Instance. So, your Amazon EC2 instance is fragile. Just as fragile as anything you’d run at home. More so, in some cases, because you don’t control any of the hardware. Out of sight, is out of mind. So, backups are not only a good idea, they are required. But how do you perform image backups of your EC2 Instance so you can recover quickly to a working base image? Copy your two Security credentials to your Server and into the /mnt/bundle directory: cd /mnt/bundle sudo mv /home/[YOUR HOME]/cert-X509CERT.pem . sudo mv /home/[YOUR HOME]/pk-PRIVATEKEY.pem . You’re now ready to build your Amazon Machine Image. Please specify a value for arch [i386]: Copying / into the image file /mnt/bundle/BUNDLE-NAME.ami... Excluding: /sys/kernel/debug /sys/kernel/security /sys /proc /sys/fs/fuse/connections /dev/pts /dev /media /mnt /proc /sys /etc/udev/rules.d/70-persistent-net.rules /etc/udev/rules.d/z25_persistent-net.rules /mnt/bundle/BUNDLE-NAME.ami /mnt/img-mnt 1+0 records in 1+0 records out 1048576 bytes (1.0 MB) copied, 0.00253524 s, 414 MB/s mke2fs 1.41.9 (22-Aug-2009) Bundling image file... Splitting /mnt/bundle/BUNDLE-NAME.ami.tar.gz.enc... Created BUNDLE-NAME.ami.part.000 Created BUNDLE-NAME.ami.part.001 Created BUNDLE-NAME.ami.part.002 [...] Created BUNDLE-NAME.ami.part.283 Created BUNDLE-NAME.ami.part.284 Generating digests for each part... Digests generated. Unable to read instance meta-data for ancestor-ami-ids Unable to read instance meta-data for product-codes Creating bundle manifest... ec2-bundle-vol complete. You now have an AMI Backup of your entire Instance. However YOU’RE NOT DONE! Currently, this AMI is sitting in your /mnt partition. This is a temporary storage area, so it can be deleted at any time. You need to upload this AMI to your S3 account for permanent storage. In order to have a location at S3 to upload your AMI to, you first have to create a Bucket. 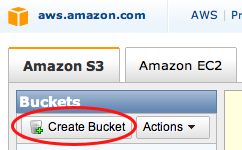 If you’re not sure what a Bucket is, or if some of the Amazon S3 terminology is unfamiliar to you, try reading the Amazon S3 Wikipedia article. If you already have a Bucket ready to use, skip this section. You now have a Bucket where you can store your AMI files. You’re now finally ready to upload the AMI to Amazon S3 for permanent storage. Uploading bundled image parts to the S3 bucket BUCKET-NAME ... Uploaded BUNDLE-NAME.ami.part.000 Uploaded BUNDLE-NAME.ami.part.001 Uploaded BUNDLE-NAME.ami.part.002 [...] Uploaded BUNDLE-NAME.ami.part.283 Uploaded BUNDLE-NAME.ami.part.284 Uploading manifest ... Uploaded manifest. Bundle upload completed. **CONGRATULATIONS **! 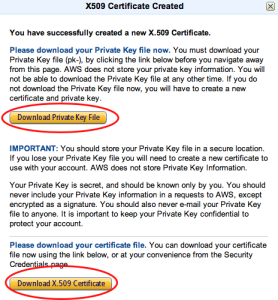 You now have an AMI safely stored at Amazon S3. You should now see your AMI listed. If so, you’re done. This step is optional and I’m not going to go into much detail about it. You should always test your backups, because that’s the only way you’ll know if they will work properly when you really need them. However, in order to test the AMI, you’ll have to spend some amount of money to spin up a new EC2 Instance using your saved AMI. Fortunately, you probably only need it for about an hour, and that’s the beauty of Amazon EC2, because an hour of time is dirt cheap. I hope you enjoyed this HOWTO, this is the most detailed explanation I’ve found on how to do this properly and what to expect. If you liked it, please click one of the buttons below and tell someone about it. Thank you!